You can watch my three days in the Bahamas video. 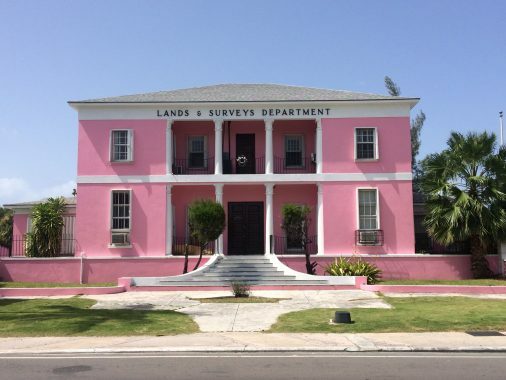 My three days in the Bahamas trip was a last-minute idea. Fourth of July was coming and I did not want to stay in the U.S. However, I was not willing to spend a lot of money on a last-minute trip. So, I spent hours and hours trying to find a good deal on some of those popular webpages that offer packages and getaways. Most of the trips were too expensive! 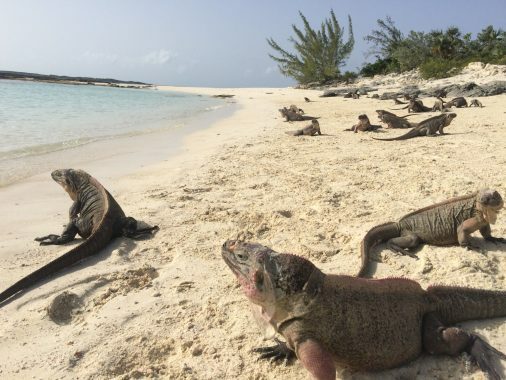 Finally though, around 2:00 AM I found a deal to Nassau for about US$ 700 that included the flight and accommodations. Without hesitation I took the deal. 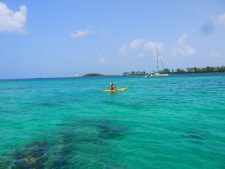 With the package booked I started to look for things to do in the three days in the Bahamas (the country has more than 700 islands). 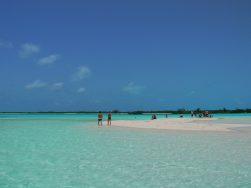 I knew that I did not want to spend my three days in the Bahamas staring at the crystal clear turquoise water. 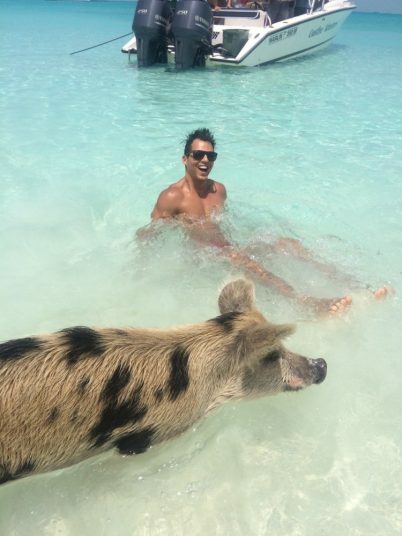 I’d seen pictures of the swimming pigs of Exuma, yes pigs can swim, but I was not sure if I wanted to swim with them. 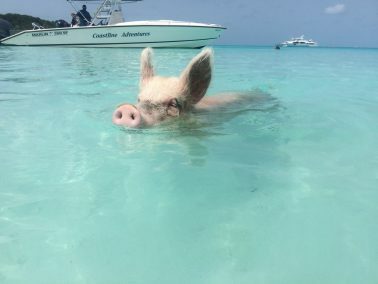 Online I found an interesting excursion: swimming with the famous pigs, and also swimming with sharks. Sharks??? OMG! 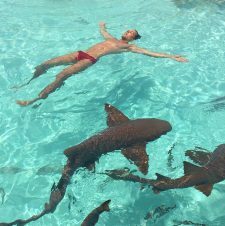 I never thought I could swim with sharks. Actually the idea made me nervous. But, I thought it must be safe otherwise would they take people to do it? 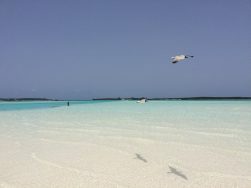 I did some research, and I finally decided to spend the additional US$200 for the excursion plus the flight from Nassau to George Town, Exuma. With just a backpack I headed to JFK airport for the three-hour flight. As we got close to land I could see the different shades of blue water that was waiting for me for the next three days in the Bahamas. 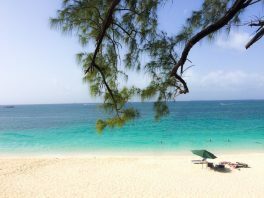 As soon as I arrived at Nassau airport I asked at the tourist information desk for the most beautiful beach. This is a difficult question because all of the beaches are beautiful. But I did get directions to one beach called “love beach.” From the cab I realized that they were completely right. The beach was so amazingly gorgeous that I had to take my polarized sunglasses off to believe what I was seeing. My hotel in the Cable beach area was very simple, as I expected, and I felt grateful because it was not overbooked as I had read in many reviews. My room had a funky smell however, so I was glad they changed my room for another on the second floor with a balcony and a pool view. The upgrade was good but for me it wasn’t important because I planned on staying in the hotel only to sleep. So I bought a map and took a cab for US$ 5.00 with a Bahamian man who saw me waiting for the bus. He said that buses were for locals and that I should ride with him. I got off in front of a resort with a beachfront restaurant open to the public. 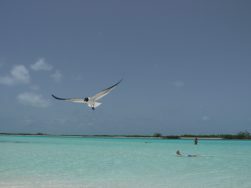 The weather wasn’t great, but luckily the sun was shining and the turquoise water was sparkling. I took some good pictures while I waited to eat a famous Bahamian dish, conch fritters. While I was eating rain came pouring down. The sky changed dramatically but I was told it was just a summer thunderstorm, and it was. After lunch I relaxed, took a nap on one of the beach chairs by the pool, and walked on the beach. I thought about staying there for the sunset but the weather was still not that great so I took a bus back to the hotel. 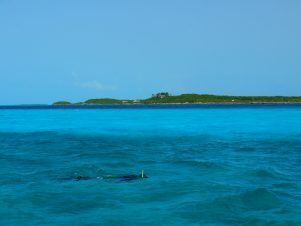 The next day I woke up very early to take my flight to Exuma. In less than 24 hours I was back at the airport. I checked-in at Bahamas Air; I walked to the gate and I walked to the runway. The airplane was so old that I doubted if it could fly safely. I was so scared the whole 40-minute flight and I was so glad when we landed. A driver from Coastline Adventures picked me up at the airport and after around 50min we arrived at the pier to take the boat to the excursion. 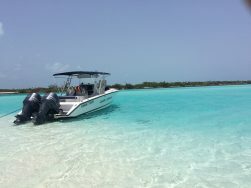 The speedboat left the dock and the music blared: “Bahamas, Bahamas…” The people aboard started to drink, dance, chat and laugh; I was having a blast. The pilot stopped at some points to tell us about some private islands and their celebrity owners. At one point we watched the guide jump in the water to catch our appetizer. The weather was perfect, and as we moved forward, the water changed colors: blue, deep blue, light blue, turquoise… I wondered how many shades of blue there could be? 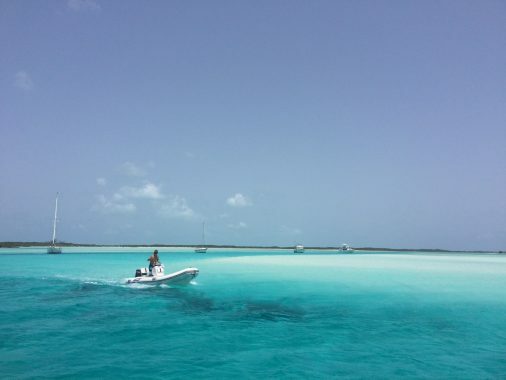 Different shades of blue, Exuma, Bahamas. Our guide catching some conchs. The boat ride seemed endless. We rode almost two hours until we arrived at the first destination: an island with clear turquoise water and white soft sand. I was astonished with its beauty and I wondered why we stopped there until I saw its inhabitants. 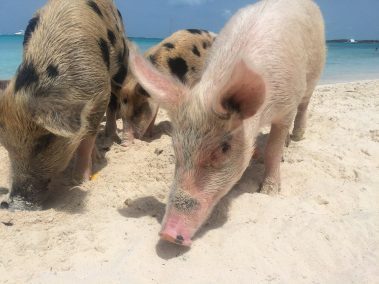 Dozens of pigs of all sizes and colors were on the sand, and some of them were in the water. We got pieces of bread and jumped off the boat. I had a lot of fun feeding the pigs and swimming with them. Some of the pigs were very lazy and did not want to go into the water just for a little piece of bread. Yet the pigs were kind of cute, especially the baby ones. 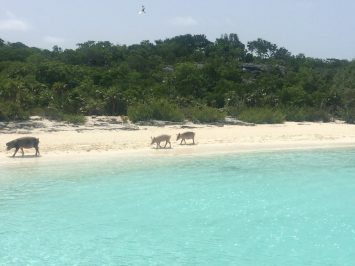 How the pigs arrived on the island nobody knows, but the fact is they live in a piece of paradise. After a short ride, we stopped at a sandbank in the middle of the ocean. I could walk for many meters with the water just at my knees. 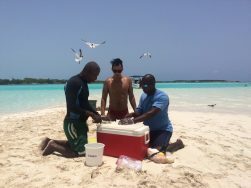 While we relaxed and took pictures, our captain and the guide prepared conch salad, an exquisite Bahamian dish. The dish was tasty, much better than the conch fritters I had the day before, and I had three portions… I was getting so excited because after the sandbank we were heading to Compass Cay to finally see the sharks. Our staff preparing the conch salad. 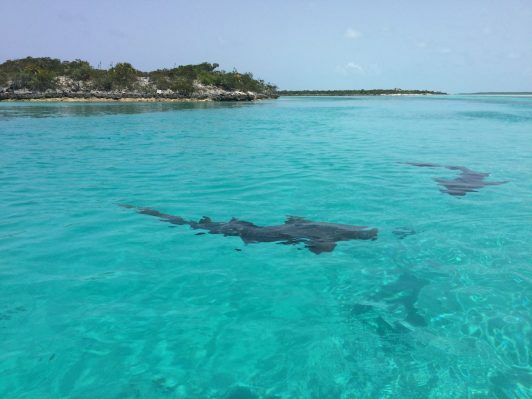 As we came into Compass Cay marina we could see other boats and also sharks. The boat parked and I saw sharks swimming back and forth underneath our boat. 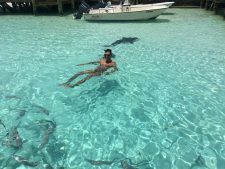 It was the first time I saw a shark and I could not believe that I was there not just to see sharks but also to interact with them. I had to pay US$ 10 as a maintenance fee in order to swim with the sharks. At first I just sat on the pier speechless because of the amount and size of the sharks. Some of them were very big! I reached down and started to pet them. A woman from D.C. was the first one from our excursion to jump in the water. 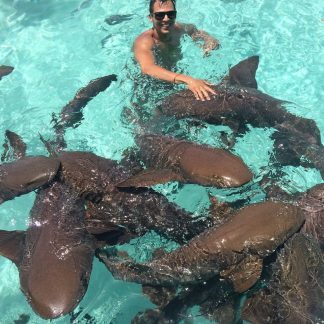 Our captain fed the sharks throwing pieces of fish to them. 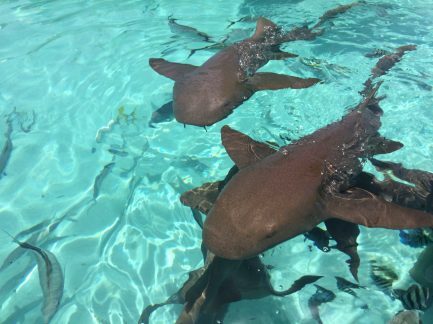 Nurse sharks are harmless but they are not vegetarians. When the woman got out of the water it was my turn. What a memorable experience! At one point I was surrounded by at least fifteen sharks. They were all coming because of the food of course, but I was petting them and they did not mind at all. I did not expect that sharks could be so friendly! 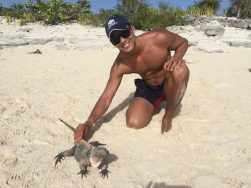 I was in the water as much as I could, whether petting or swimming with them. It was magical and unforgettable! 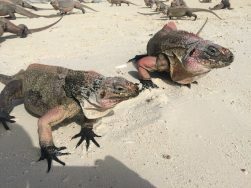 We still had three more stops on our excursion: one for lunch, one for visiting another island inhabited by hundreds of iguanas, and the last one for snorkeling at Thunderball grotto where they shot two James Bond films. 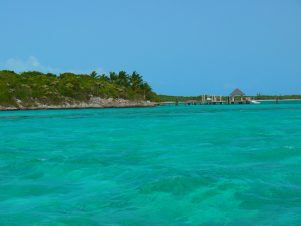 I left Exuma convinced that it was the best decision I could make when I decided to come to the Bahamas. I still had one more day but I knew that this Fourth of July was unbeatable. Sunday the 5th I went to a beach in downtown that a friend suggested to me. 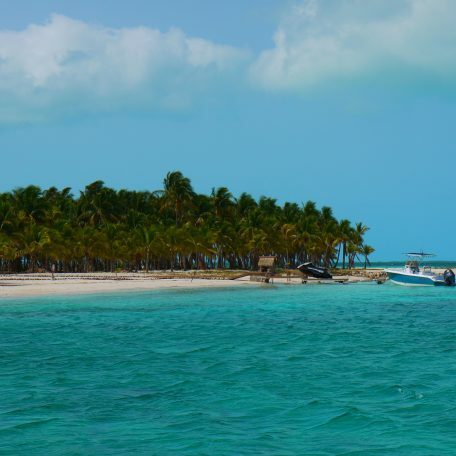 Junkanoo Beach is located by the port, and because of that it’s one of the most visited beaches in the Bahamas. 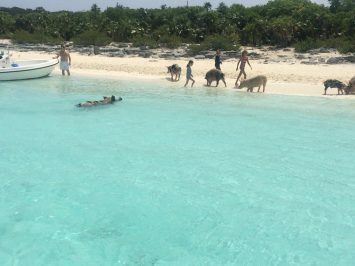 The infrastructure was not the best one; the sand was not that soft because of the rocks, but the water… turquoise crystal clear and warm. There were two piers, one on each side of the beach, making a kind of pool in the middle. From the beach I could see some of the ships at the port, people kayaking and a lighthouse across the bay. I mingled among tourists and locals. 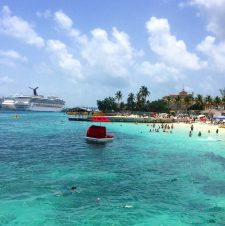 It felt terrific in the sun and I could have stayed in the water the whole day, but I wanted to check the downtown and the famous Paradise Island. 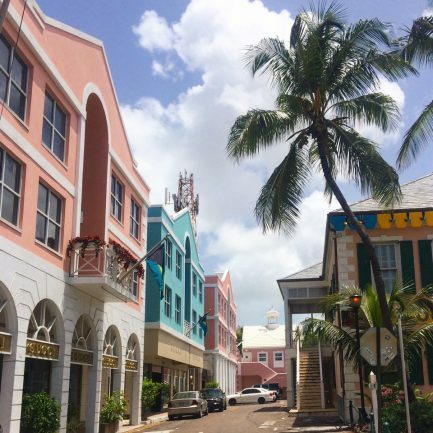 A few steps from the beach was Nassau’s downtown area, it was full of colonial and colorful houses. There was also a market selling souvenirs. 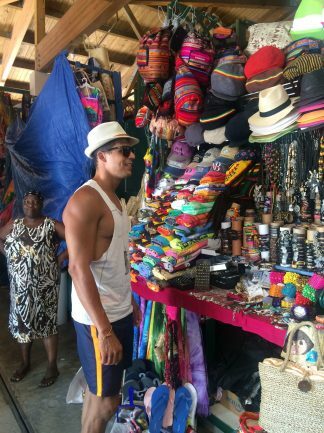 Stores, restaurants and this market depend heavily on tourists arriving from the ships. By 4:00 in the afternoon everything was closed and the streets were deadly quiet. I had lunch and I headed to Paradise Island. I could have taken a cab or even a taxi, but I decided to walk and explore a little more of the downtown. The sun was burning my shoulders, but I wanted to get a longer view of the beautiful colonial architecture. 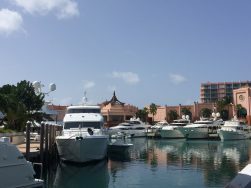 After a 25min walk I reached the bridge that connects New Providence Island where Nassau is located, and Paradise Island the most famous Bahamian island. 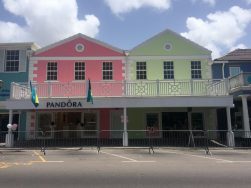 Beautiful colonial architecture in downtown, Nassau. 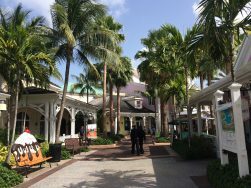 Paradise Island is where many of the famous resorts and hotels are: Atlantis Bahamas, One and Only, RIU, nearly all of them. 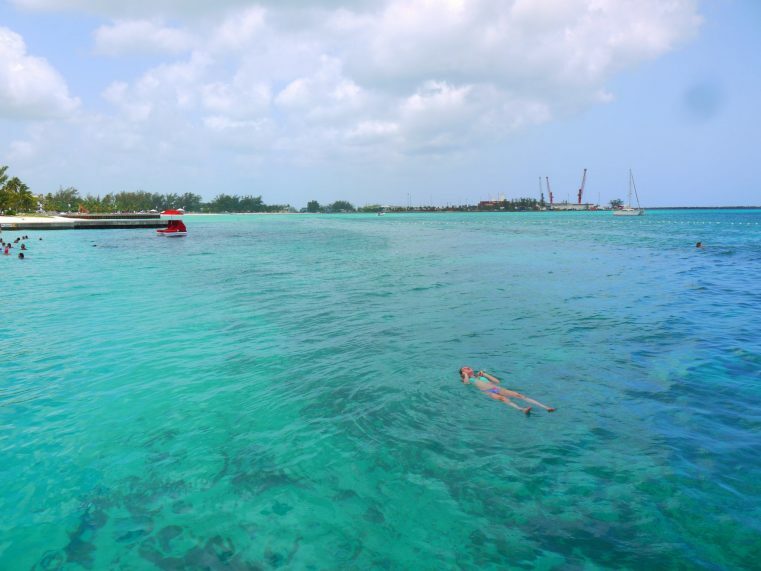 There is also a marina, a casino, an aquarium, restaurants, shops and modern amenities. I stopped by the marina, which was full of stores and beautiful palm trees to take some pictures and refresh, and then I headed to the beach. 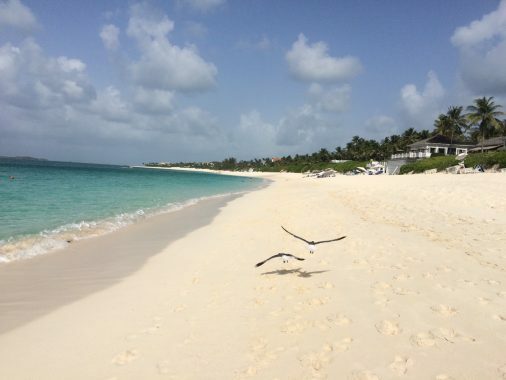 The beach was 2 miles long and pristine with powder-white soft sand. It was very quiet and relaxing, and I felt as if I was in a paradise, and in fact I was. 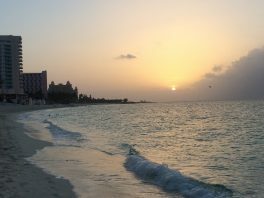 I walked, took naps, and after the sunset I headed back to Nassau. On Monday morning I woke up very early to enjoy my last morning in the Bahamas. I went running, swimming and did some yoga on the beach. By 4:00 PM I had landed in JFK without a penny in my wallet but feeling as if I had been away for months rather than three days and feeling as if I had been to a paradise. This post was convert into an app, and you can get it here. 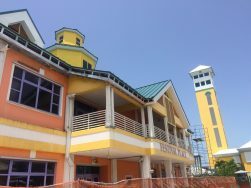 ∗ The main airport is the Nassau International Airport, now known as Lynden Pindling International Airport, is situated 10 miles (16 km) west of Nassau, New Providence Island. 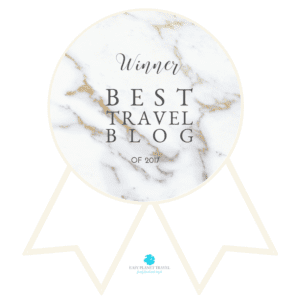 You can book your flights with Skyscanner or Momondo that are the websites that I use. 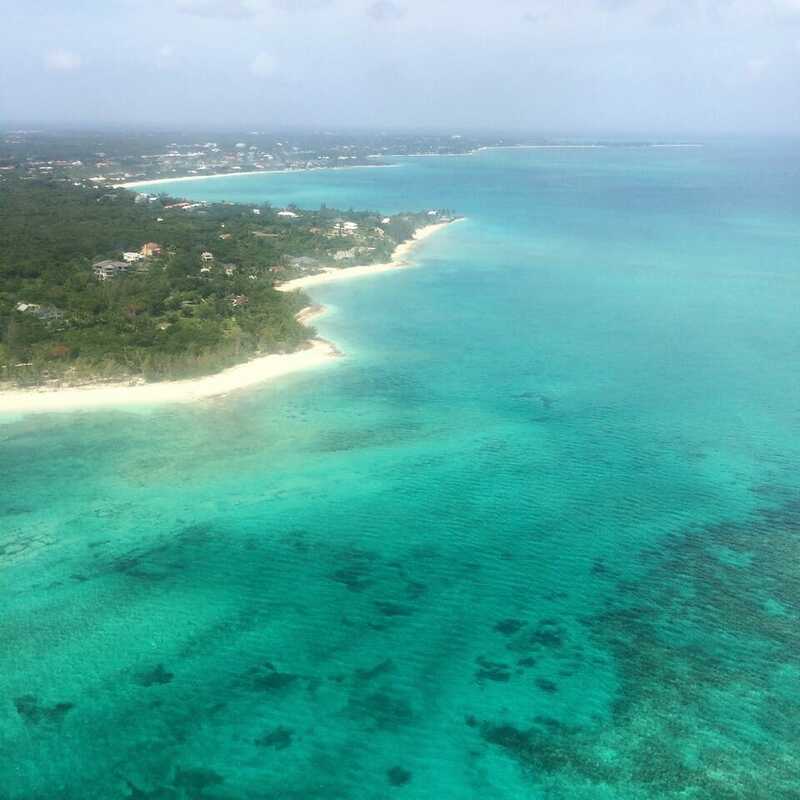 ∗ From the U.S. are direct flights with: Delta, United, JetBlue, BahamasAir and Southwest Airlines. ∗ From Canada are direct flights with Air Canada. ∗ From other countries is easier fly to the U.S. especially Miami or Fort Lauderdale and take another flight from there. ∗ To Exuma, there is an international airport in Moss town, northwest of George Town, and there are direct flights from Nassau, Miami, Atlanta and Toronto. ∗ Theres is also a ferryboat from Nassau to Exuma with Bahamas Ferries. 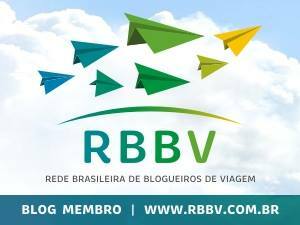 ∗ Package with Travelocity including airfare and accommodation: around US$ 700. 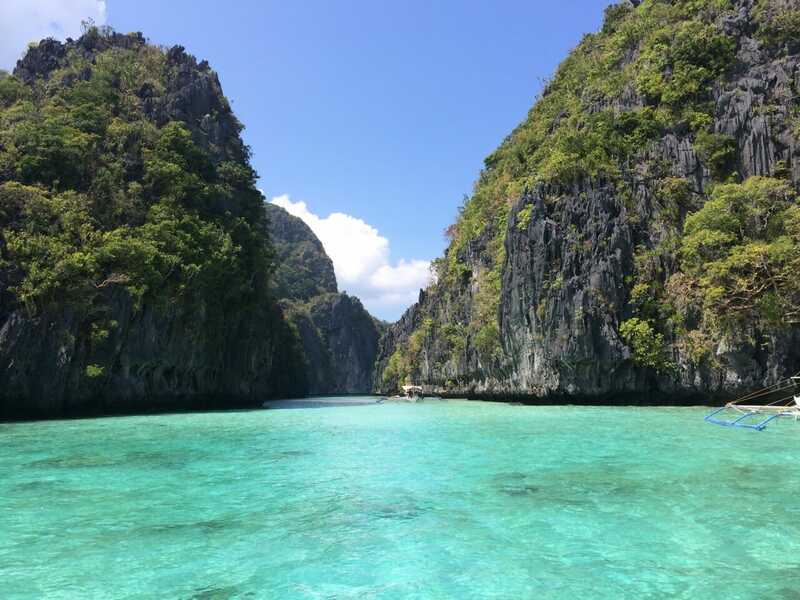 ∗ Coastline Adventures tour: US$200. 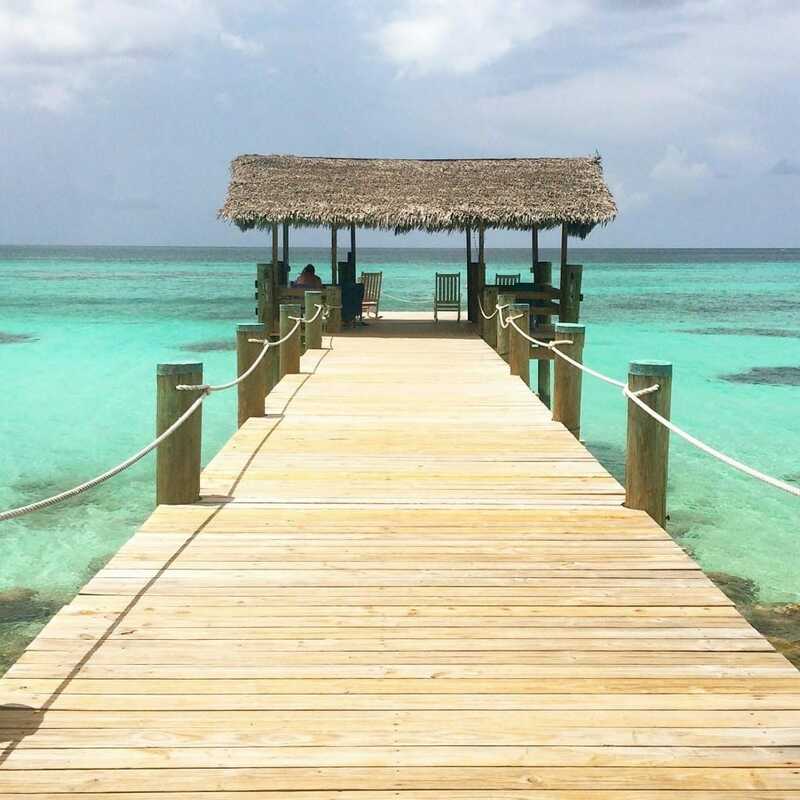 ∗ Roundtrip flight from Nassau with BahamasAir: around US$100. It looks beautiful! 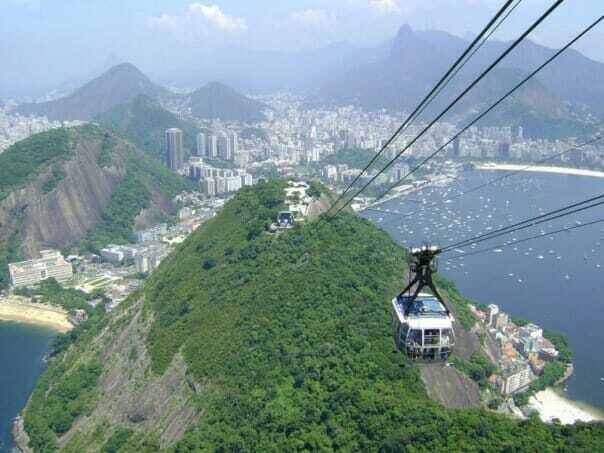 I would really love to go.